AleaSoft, August 9, 2018. 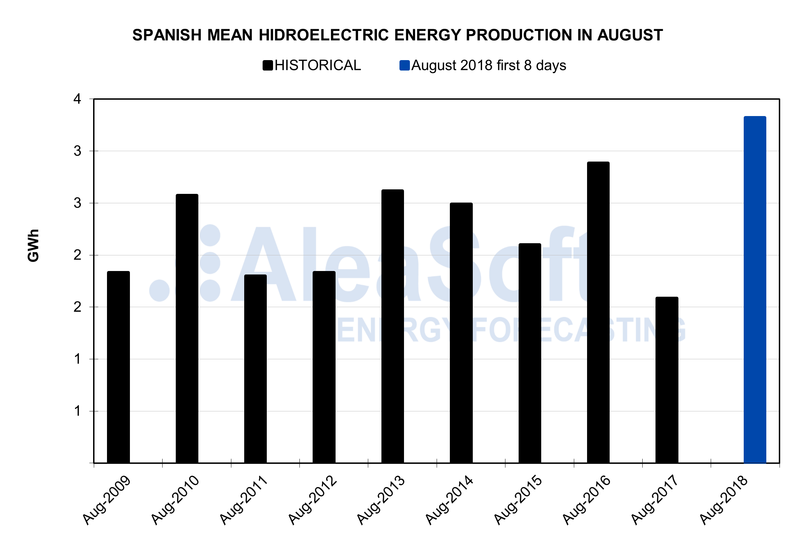 At the beginning of August, record values of temperature and electricity demand in Spain were recorded as a result of the heat wave experienced in the peninsula. This increase in demand, together with an increase in fuels prices used for electricity generation and lower wind production also led to reaching record levels in MIBEL market prices. 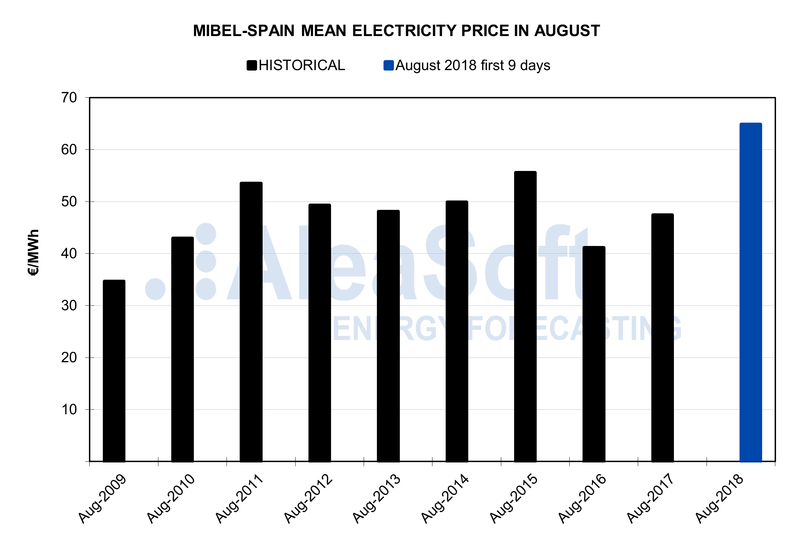 The Spanish electricity price in the MIBEL market also broke records during the beginning of August, due to the heat wave lived on the peninsula. 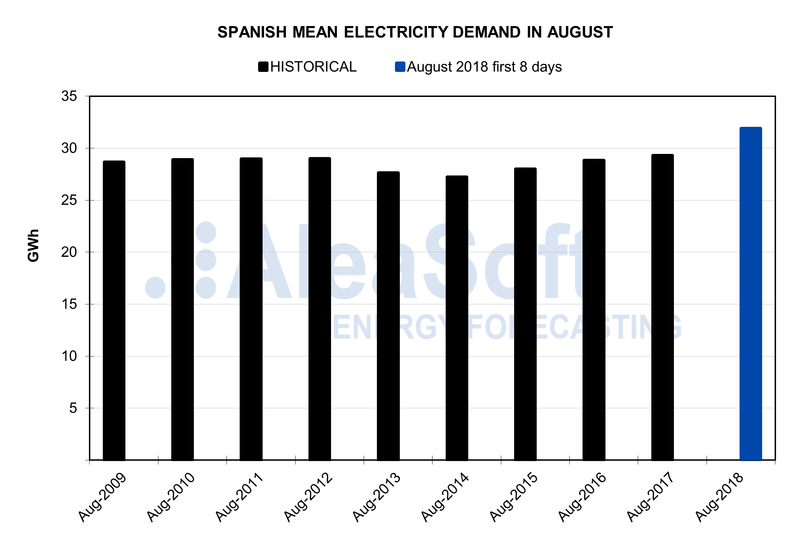 Specifically, on August 6 was recorded the highest average daily price of the last decade: 68.51 €/MWh; and also this day was achieved the maximum hourly price for an August in the last ten years: 74.82 €/MWh at hour 22. The average price of the days elapsed this August was 64.88 €/MWh, up to the session closure on August 9. 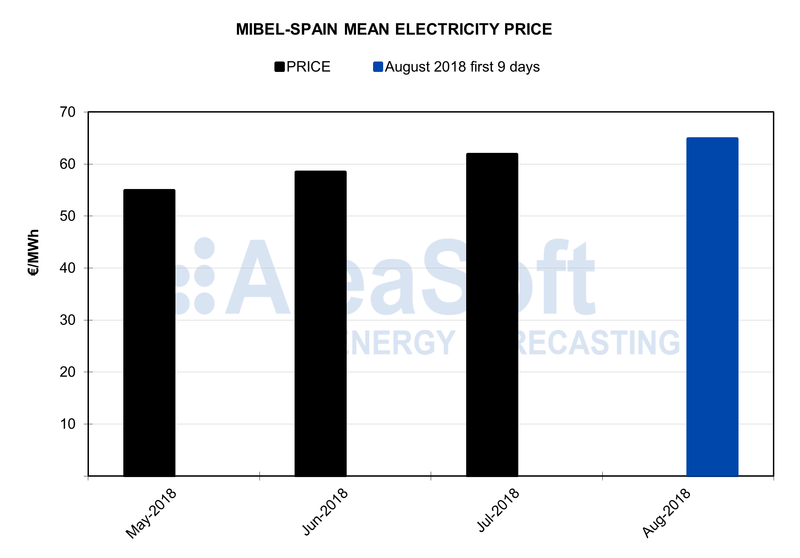 Since May this year the monthly average price has been increasing above 3 €/MWh each month, although the data for August is the average of only nine days. Electricity demand is also breaking records during this month of August. 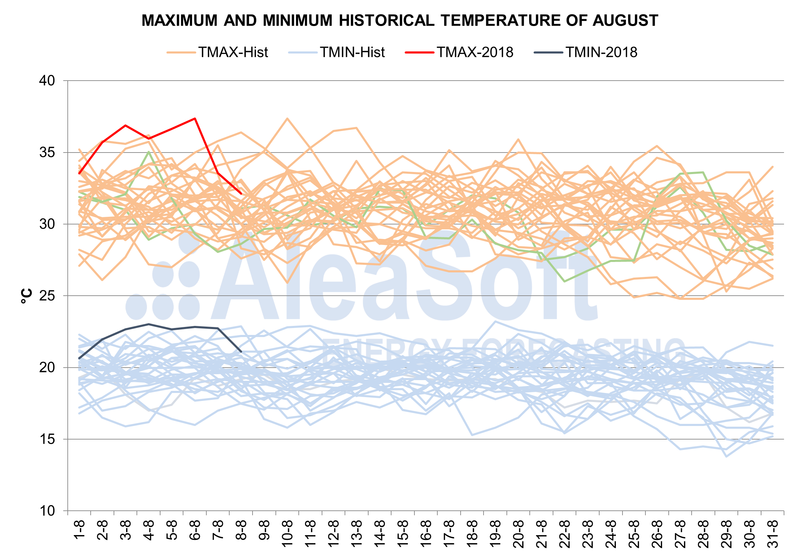 The past August 3 registered the highest average daily demand and the maximum hourly demand for an August in the last ten years: 33.8 GWh and 39.6 GWh respectively. In the first days of August the demand has increased 4.2% with respect to the previous week. 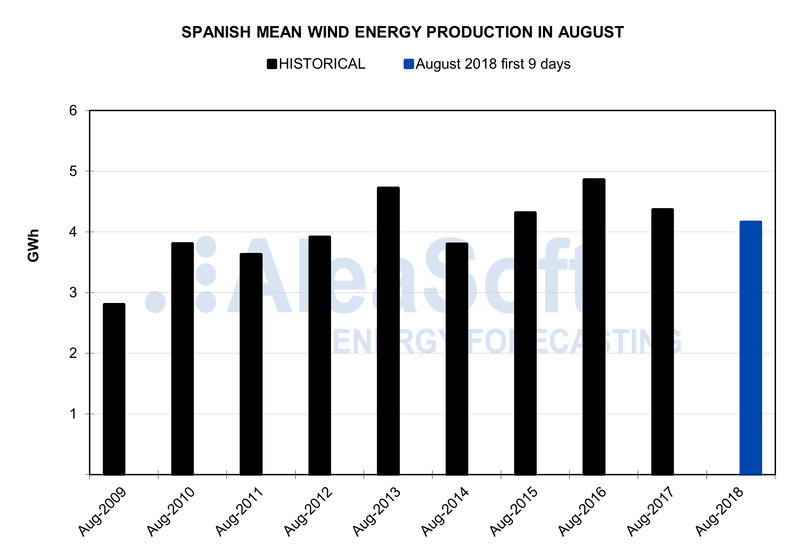 In the AleaSoft analysis about renewable energies, so far this month, wind energy production is being lower, solar energy production is at similar levels and hydroelectric energy production is being higher than in previous August. Following the AleaSoft analysis, in the first week of August Brent oil price maintained a growth trend until August 7, but on August 8 there was a drop in black gold price after knowing that China will increase tariffs to petroleum derivatives imports and also due to an increase in gasoline oversupply. In the August 8 session, Brent oil futures for October 2018 were quoted at 72.28 $/bbl, 2.37 $/bbl less than the previous day. The prices of the rest of the main fuels for electricity generation increased; another upward pressure factor on the electricity price market. Gas futures price for September 2018 closed yesterday August 8 at 22.60 €/MWh, 0.67 €/MWh more than the previous week. Price of API 2 European reference coal futures for August 2018 closed at August 8 session at 97.00 $/t, 2.05 $/t more than at August 1 session. However, CO2 emission rights price has moderated its upward trend, and this week that began on August 6, it fell compared to the values traded the previous week. In August 8 session, futures price for December 2018 closed at 17.39 €/t. 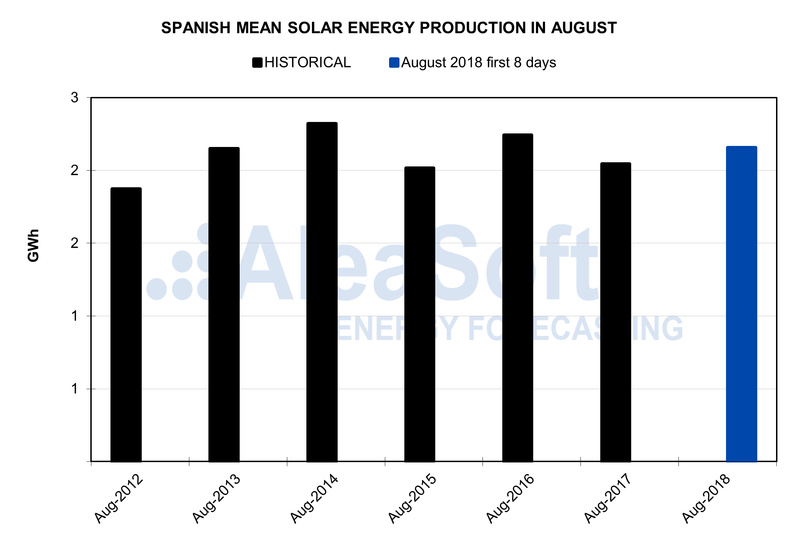 Electricity futures for Q4 in the OMIP Spanish market have remained stable during the week that began on August 6 closing at 66.15 €/MWh in August 8 session. However, the futures price for year 2019 increased almost one euro compared to the week of July 30, and in August 8 session was negotiated at 57.05 €/MWh. 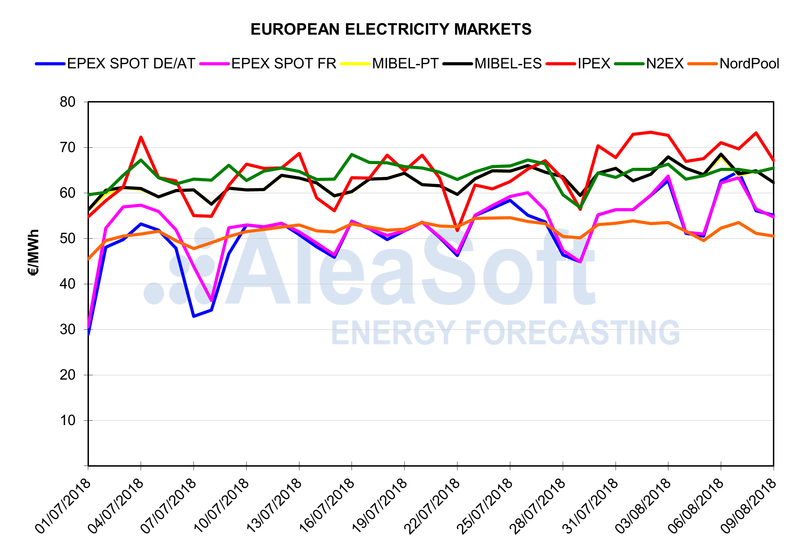 According to AleaSoft forecasts, for next days from August 9 temperatures will fall until reaching the usual values for this time of year, which will press down the electricity demand and the prices in the wholesale market MIBEL. 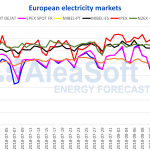 Heat wave of the beginning of August was also noted in prices of main European electricity markets. 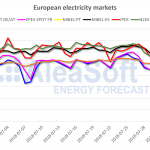 With the exception of NordPool market, in the rest of European markets the average price of the last seven market sessions, since August 3, have risen compared to the previous week, with increases above three and four euros in the case of EPEX SPOT France and EPEX SPOT Phelix markets respectively. Italian market IPEX has been the most expensive among the European markets since August began.